Place the goat cheese, 1 tablespoon of the bread crumbs, garlic, rosemary, egg yolk, and salt together in a small bowl and blend. Combine 3 tablespoons of the bread crumbs, pecorino, and pepper in another small bowl. Set aside. Trim the excess fat from the rack of lamb, and trim and clean between the rib bones. Rub the oil over the meat and season with the seasoning salt. Place the lamb on a rack in a shallow baking pan and bake for 20 minutes, or until a meat thermometer inserted into the thickest part of the meat reads 110º F. Remove from the oven and reduce the oven temperature to 450º F. Coat the topside of rack of lamb with the goat cheese mixture. Pat the bread crumb mixture over this, pressing slightly so it adheres. Return to the oven and cook for 20 minutes, until medium rare. The internal temperature should be 145º F. on a meat thermometer and the cheese crust should be golden brown. If a more browned crust is desired, place 3 inches under a high broiler for a few minutes before the lamb reaches 145º F. Remove from the oven and let rest for 3 to 5 minutes. 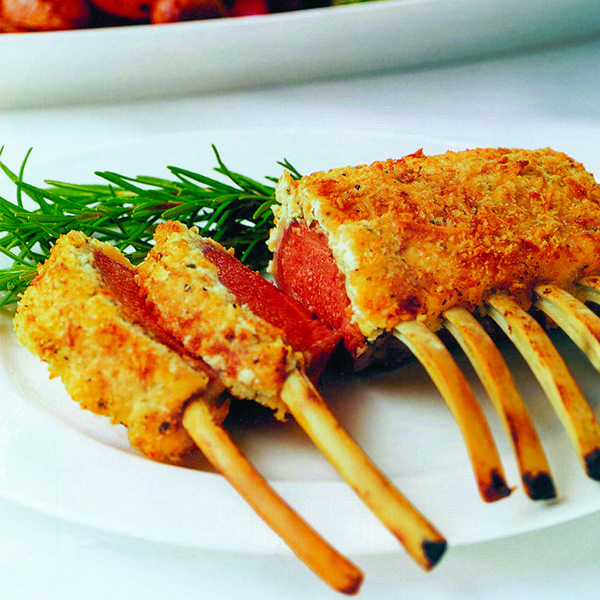 To serve, cut the rack into chops. Be careful to keep the crust with each chop. Garnish with rosemary. Serve 2 chops to each person.